There are just days until Junior Eurovision 2012 (something that could’ve been said this time last year, but the amount of days would have had more digits) and boy, have I got a lot of stuff to cram in to such a short period! There’s playlists to be made, reviews to be finished (I should probably start them first), doppelgangers to track down…yikes. Time-wasting is not an option, so let’s get on with the JESC countdowns. Today I’m rewinding four years to when Cyprus hosted its first contest of any sort. Macedonia – maybe I’m biased because Bobi is Australian. Then again, maybe this song is just awesome. I thought Macedonia had the contest sealed up, in the bag and then handed to them on a silver platter with Prati Mi SMS…but top 5 is nothing to complain about (unless you’re Danny Saucedo). Malta – this is my favourite Maltese JESC entry, and possibly my favourite of all the songs they’ve sent to any Eurovision-related event. It’s so much fun that Daniel never needs to tell me more than once to come and join his junior swing! Belgium – another year, another ballad from Belgium that, at least in my eyes, should have scored better than it did. I guess songs like this are too boring for a lot of people to pick up the phone for, but I dig them. Greece – it’s not exactly happy and bouncy, but it’s catchy and it makes me want to salsa (which is odd considering it’s a Greek entry). I think it was underrated, but let down a bit by Niki’s performance. Ukraine – irresistible dancey fun! Why is it that songs about sailors and whatnot are always/usually so good? Then again, I think Ukraine could send a song about ingrown toenails to JESC or ESC and it would sound amazing. Macedonia – here’s someone who improved with age. He was great in ’08, and if you Youtube his Australia’s Got Talent performances, you’ll hear him sounding even better. Bulgaria – you can’t blame a #vocalfail for Krastyana coming last. Malta – if he’s still got it, I’d expect to see him vying to represent Malta in the ESC someday soon. Netherlands – one of the older contestants, Marissa managed to keep up with the up-and-comers. Georgia – I don’t think much of this “song”, but I reckon the trio harmonise well, and do the tricky things required with ease. Serbia – yellow is my favourite colour (fun fact!) so it’s not surprising that I loved Maja’s outfit. I wanted a jacket just like hers back then. If I’m honest, I still do. Malta – how dapper was Daniel in his tie and braces? I’m also a big fan of a spotty dress, as worn by his stage partner and by Belgium’s Femke last year. Georgia – their group name was Bzikebi, and their song was called Bzz…. What were they going to dress as, unicorns? But these costumes were as cute as they were predictable. Ukraine – again, Diana Gurtskaya could’ve seen this one coming (*offensive joke alert*) but that doesn’t stop it from being adorable. Lithuania – I don’t get the fuss with this song, but Eglė looked so sweet with her pigtails and Peter Pan collar and long socks. Clockwise, from bottom left: Maja, Daniel, Bzibeki, Victoria, and Egle. Armenia – I don’t know why, but I find this so annoying. It’s not catchy, it’s hard to sing along to, her voice is weird…okay, maybe that’s why. Georgia – does this even belong in this category? Does a few minutes’ worth of buzzing really constitute a song? If it does, there are a lot of people making music every time they use their electric toothbrushes. Lithuania – as I said, I don’t get why people love this so much. It’s okay, but the ‘wa-oh, wa-oh-oh’ bits irritate me so much. Cyprus – I don’t mind this, but I had to pick something! I will say that I have to be in the right mood to listen to it, or it just seems like noise. Greece – from someone who tried too hard to someone who was a bit lacklustre: I got the impression Niki didn’t want to be on stage (nerves?) and it showed in her voice. Bulgaria – there’s no sartorial pairing quite like stripes + gaudy and distracting plastic glasses + PVC aprons with pants underneath, is there? I really like this song, but those outfits were bad. Perhaps they were the reason Bulgaria came last. PS – What do you think of the special JESC Month header? Not bad for someone without Photoshop, right? Right??? Posted on November 5, 2012, in Junior Eurovision and tagged best, Bobi Andonov, Bzibeki, Bzz..., costumes, Cyprus, Georgia, JESC, Junior Eurovision 2008, Limassol, Macedonia, winners, worst. Bookmark the permalink. 4 Comments. I love the new header! Especially since you used polaroid textures\brushes [whatever you used in order to create the polaroid effect thingy] and I love those 😀 and I really like the font you used for the countries, and and and it’s so much nicer than let’s say the official logo. And I’m being serious there. Anyway, jesc 2008. I TOTALLY agree on Georgia! A bunch of bzzz is NOT a song and shouldn’t be considered as such. I actually liked Lithuania, but I get why people don’t like it. I just thought Egle was really charismatic and had good stage presence and I love the “hello Cyprus” bit and the song is cute, but it is a bit monotone and does get repetitive. Cyprus is ok too, but I really disliked the performance and costumes. Macedonia: I also thought this was going to win. Romania: I’m not really into “save the world” songs, but this one was catchy and Madalina’s voice is just amazing. Malta 2008 is the best jazz song ever in jesc. And Greece has one of my favorite lyrics in the contest. Well, the Azeri version of ‘Boys and Girls’ or ‘Girls and Boys’ or whatever the heck it’s called has emerged at last! It’s so cool to hear an ESC (ish) song in Azeri. I think it’s better than the full English version, actually. I agree that Egle was a good performer, I don’t want to take that away from her. And her dress was so cute. Okay, Belarus is catchy. Na na na na na na na…that’s all I hear when I think about it! I agree on Madalina too. She just missed out on being included in my top vocalists (she must be soooo devastated). It’s a shame that Bulgaria is most remembered for the hideous costumes, because the song is really good, IMO. 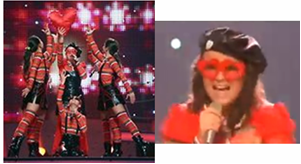 I swear if Bulgaria had worn something remotely normal, the live show wouldn’t have failed them.